Although law books through history have not generally been known for their abundant illustrations (unlike medical printing where images were a critical adjunct to the text), the law books featuring visuals used them creatively, and sometimes dramatically, even if sparingly. 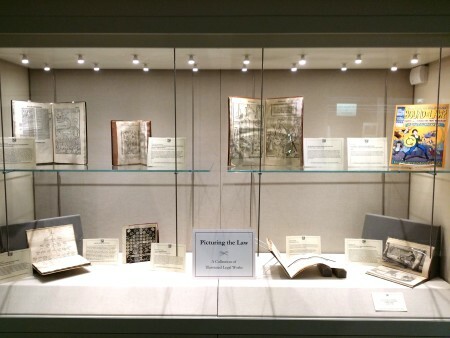 Picturing the Law: A Collection of Illustrated Legal Works, the Law Library’s Winter 2016 exhibit now mounted in the first floor display case, presents eight selections from Special Collections, ranging from an early manuscript to a comic book, and dating from the 1460s to 2006. 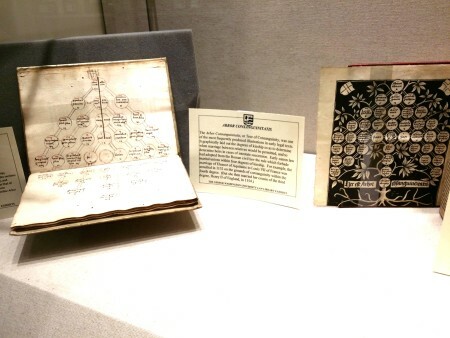 What does a law book illustration “do?” It can instruct, as demonstrated by the Tree of Consanguinity schemata which chart degrees of kinship, guiding the audience to avoid marriage to blood relatives within the forbidden range. It sometimes sets a cautionary example, such as the Bamberg penal code’s graphic representations of breaking on the wheel and the instruments of torture which await the malefactor. It may serve as a reference, such as the Damhoudere woodcuts which depict the crimes the author catalogs, or the print of the land-chain measure showing the length of the “Kettenmass” from Walds Ordnung. Or, it can add color and sensation to descriptions of historical events, as in the account of the trial of Congressman Daniel Sickles for the murder of Philip Barton Key. It might impress its audience with the grandeur and import of the law through the symbolic images in Guillaume le Rouillé’s multi-legged monster allegory of injustice. And the law comic books produced today command attention and entertain with their vivid colors and manic action while bringing points of law to life. Introducing pictures to a law work has not been a desultory exercise; intent to instruct and impress, and a desire to match image closely with text, historically have fueled the enterprise to illuminate the law for its readers. Two Trees of Consanguinity. Left: Lectura Johannes Andreae, a German manuscript commonplace book, c. 1464-1471. Right: Giovanni d’Andrea’s 1500 Arbor Co[n]sanguinitatis. Giovanni d’Andrea. Arbor Co[n]sanguinitatis. Vienne : Johann Winterburg, 1500. [Manuscript]. Giovanni d’Andrea. Lectura Johannes Andreae [and other works]. [Germany, between 1464 and 1471]. Bambergische Peinliche Halszgerichts-Ordnung. Bamberg : Johann Wagner, 1580. Joost de Damhoudere. La Practique et enchiridion des causes criminelles illustrées par plusieurs élégantes figures. Louvain : Estienne VVauters & Iehan Bathen, 1554. Walds Ordnung. [Nuremberg (? ), 1535]. Felix G. Fontaine. Trial of the Hon. Daniel Sickles for Shooting Philip Barton Key. New York : R.M. DeWitt, 1859. Guillaume Le Rouillé. Justiciae atque iiusticie descriptionu[m] co[m]pendiu[m]. Paris : Claude Chevalion, 1520. Keith Aoki. Bound by Law? Tales from the Public Domain. Durham, N.C. : Duke Center for the Study of the Public Domain, 2006.